During the holiday season, it’s important to talk with your house guests to make sure that no one gives your pet treats without your consent. This is the best way to ensure that your pet doesn’t eat anything without your knowledge. It is also important to keep an eye on fallen scraps that your pet could pick up and eat without warning. We recommend keeping your pet in a separate room during holiday parties to avoid this concern. Remember, if your pet does consume food that is dangerous for them, we are a phone call away and will come to you for convenience and peace of mind. 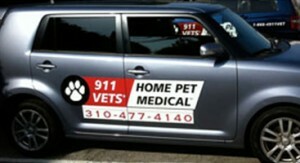 You and your pet deserve to safely enjoy all the holidays have to offer and 911 Vets wants to make sure that happens. We also come to you for routine check ups, diagnostics, ultrasound, treatments, hospice care, as well as gentle home euthanasia and aftercare.